Harold “Hal” Moore, commander of the 1st Battalion, 7th Cavalry, led outnumbered troops to victory in Ia Drang Valley in 1965 -- the first major battle of the Vietnam War. His understanding of what motivates members of the military is reflected throughout the 2016 Stars and Stripes edition of Heroes, which began in 2005 as a tribute to valor for the war on terrorism. Since then, the focus has expanded to include medals awarded years late – Medal of Honor recipient Charles Kettles, whose daring helicopter rescue amid heavy enemy fire came in 1967 in Vietnam – and medals delayed by missing paperwork, like the Silver Stars awarded to former Sgt. Eric Robert II and retired Chief Master Sgt. Ronald Brodeur for efforts in Cambodia in 1969. All were presented this year. Some medals were earned outside the battlefield. Staff Sgt. Joshua Schneiderman’s Soldier’s Medal came from saving a fellow fisherman in the Copper River in Alaska. Sadly, some medals mark the ultimate sacrifice. Sgt. 1st Class Matthew McClintock was posthumously awarded the Silver Star for selfless efforts in Marjah, Afghanistan, on Jan. 5. That fits anyone’s definition of a hero. 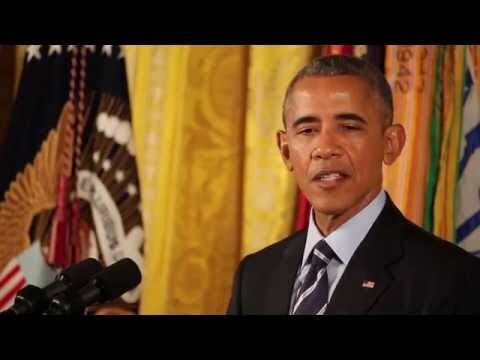 “American soldiers in battle don’t fight for what some president says on TV. They don’t fight for Mom, apple pie, the American flag.They fight for one another,” said Harold “Hal” Moore who commanded troops in the first major battle of the Vietnam War. His understanding of what motivates members of the military is reflected throughout the 2016 Stars and Stripes edition of Heroes. Eight soldiers, stranded in a dry riverbed in Vietnam, faced a grim fate as they watched U.S. gunships and other air power disappear from the sky. At some point during the long journey leading to a tiny, one-room building deep in the remote eastern Afghanistan mountains where an American civilian was being held hostage, Navy SEAL Senior Chief Petty Officer Edward C. Byers Jr. bowed his head. In a matter of seconds, Capt. 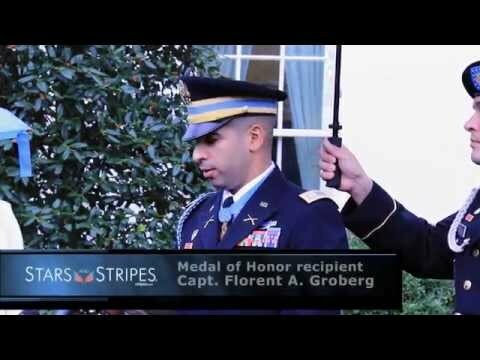 Florent “Flo” Groberg’s life changed forever. 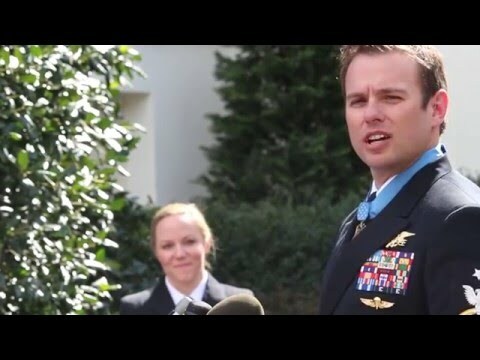 Senior Chief Petty Officer Edward C. Byers Jr., who served as a Navy hospital corpsman before joining the SEALs in 2003, is credited with saving the lives of several teammates and a hostage during a 2012 rescue in Afghanistan. Scaling buildings under heavy fire and dropping grenades down the chimney on the enemy sounds like something out of a Chuck Norris movie — yet that is what Marine Gunnery Sgts. Jonathan Gifford and Daniel Price did to break the stalemate during a hellacious battle in Badghis province, Afghanistan, on July 29, 2012. Sometimes heroism is a team effort. That’s how Petty Officer 3rd Class Evan Staph and Lt. J.D. Hess describe their roles in the helicopter rescue last year of two sailors whose boat was disabled during a winter storm 200 miles southeast of Cape Cod, Mass. Few battles waged over the last 15 years have given rise to more storied figures than the fight for a small combat outpost in Nuristan province, near the village of Kamdesh. As the sun rose on Oct. 3, 2009, about 300 Taliban launched a surprise attack on COP Keating. When 19-year-old Carl Willm’s Army platoon leader asked whether he could swim, the young private's “yes” sent him on a perilous patrol deep into enemy territory.